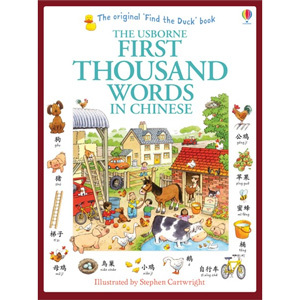 The Usborne First Thousand Words in Chinese serves as a comprehensive illustrated vocabulary-builder, teaching 1000 new Chinese words. Using Mandarin Chinese (the official and best-know dialect) and simplified characters (the version of the written language used across mainland China), it encourages direct association of the Chinese word with the object to ensure effective, long-term learning. Each object in the book is clearly labelled with its Chinese name and each word is accompanied by a standard pinyin pronunciation guide, using Roman letters. An alphabetical Chinese / English list of all the words used is provided at the end of the book. If internet-access is available, this book contains links to the Usborne website where children can listen to the First Thousand Words in Chinese, read by a native Chinese speaker. The Usborne First Thousand Words in Chinese is suitable for children of all abilities, even complete beginners. The easy-to-use pronunciation guide will help parents having no previous knowledge of Chinese to enjoy using this book with their child. If internet access is available, all of the words can be listened to on the Usborne Quicklinks website.